Short musical theme composed for fundraising events for Peace Trees Vietnam, a private foundation whose mission is the removal of unexploded war munitions, accompanied by the renewal of tree planting ceremonies. 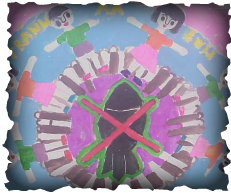 Painting by Vietnamese school children. Created during the Ghost Mountain Media era (2000-2003) during the collaboration with my good friend and business partner Walter Braswell. All music on this page by Dan Kersten/Colonel Sandals. Protected by international Copyright - BMI - All rights reserved.